This is a very warm and cozy hat. Size: To fit 21" head (small adult). Materials: Worsted weight yarn -- I skein dark brown, and 1 skein light brown, size 10 (US) knitting needles. Note: The hat is worked inside out, and with two strands of yarn -- one of each color throughout. Holding two colors together, Cast on 64 sts. Row 1 (using size 10 needle): *Slip 1 st from front needle, knit 1 st from back needle, sl 1 st from front needle, purl 1 st from back needle, rep from * across until all 64 sts have been worked. Row 2: (Sl 1, k1, sl 1, p1) across. Each two rows make 1 round. (The slipped sts will be worked on row 2, while the worked sts will be slipped. Work row 2 until ribbing measures 3 inches. (It's a good idea to slip your hand into the middle of the hat after each round to make sure it is still open. If you have accidentally knitted a slipped st, or slipped a knit or purl st, it will tie the two pieces together on the inside. Change to stockinette as follows: (Slip 1 st, knit 1 st) across. Again, two rows will make one round. Continue in stockinette st until hat measures 7 1/4 inches from top of ribbing. Decrease Row 1: (this is the tricky part, but you can do it!) By this point, you can hopefully distinguish between those sts that should be slipped, and those that should be knitted. *(Sl 1 st, k1 st) twice, sl 2 sts, drop next st, slip next st, place dropped st back on left hand needle, then slip 2 sts back to left hand needle (this puts 2 'knit' sts together), and k2 tog, sl 1 st. Repeat from * across. In essence, you have just worked k2, k2 tog on the 'back' side of the hat. Now, work the next row as follows, completing the round: *k1, sl 1, k1, sl 2, drop next st, slip 1, put dropped st back on left needle. Slip 2 sts back to left needle, and k2 tog, sl 1; rep from *. Decrease Row 2: * k 1 st, sl 2 sts, drop 1 st, slip 1 st, pick up dropped st with left hand needle, sl 2 sts back to left hand needle, and k2 tog, sl 2 st. Repeat from * across. On next row (to complete round): (k2 tog, sl 1 st, k1, sl 1) across. Decrease Rows 3,4, and 5: (sl 1, drop next, sl 1, pick up dropped st, sl 2 sts back to left hand needle and k2 tog, sl 2) across. On next row (to complete round); (k2 tog, sl 1 across). At the end of all decrease rows, you should have 4 sts left on needle. Cut an 8 inch end of yarn, and thread it through a darning needle. Pull out knitting needle, and thread yarn through remaining four sts. Pull tight, and weave ends into wrong side of hat. If desired, make a pom pom for top of hat. (Here is a really quick and easy method for making a pom pom: Take your two colors of yarn, and wrap it around your four fingers (held flat) about 50-60 times. Carefully remove loops from fingers, and tie a 12-inch length of yarn around the middle of the loops, pulling very tight. Knot several times. With scissors, cut all the loops (but don't cut the long strings you tied it with -- use those to attach the pom pom to the top of the hat). It will probably look awful at this point, but take your scissors, and give the pom pom a "haircut" until it looks round and is the size you desire. 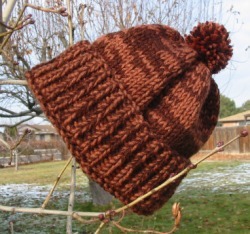 With a crochet hook, pull the long strings thru the top of the hat to the inside and knot several times. Weave the ends into the hat. Earflaps (optional) Make 2: Cast on 16 sts. Knit 8 rows. Dec 1 st at beg of next row. Repeat last row until 4 sts remain. Work I-cord on these three sts for 12 inches. Last row: Sl 2 sts as if to knit, knit one stitch, then pass 2 slipped sts over. Pull yarn through, and weave in end. Sew earflaps to opposite sides of hat.